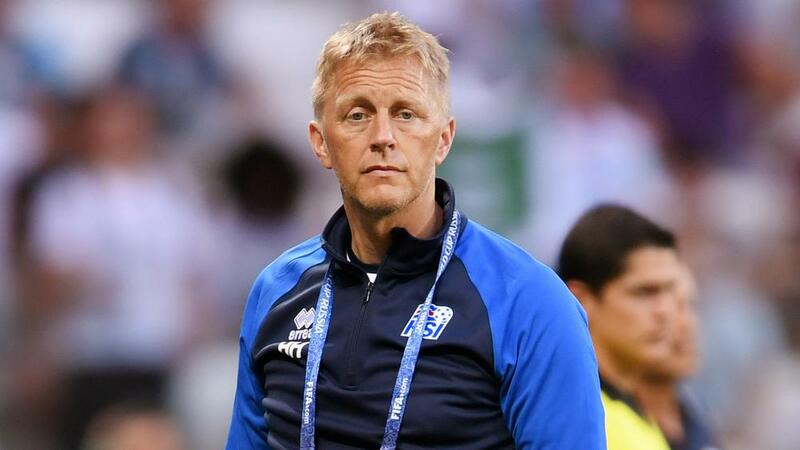 Heimir Hallgrimsson has stepped down as Iceland head coach in the aftermath of the nation's maiden World Cup appearance. The 51-year-old, who first joined as an assistant in 2011, advised the Football Association of Iceland (KSI) of his decision to move on after nearly seven years with the national team. He previously shared the top job with current Norway boss Lars Lagerback, the pair famously guiding the tiny nation to the quarter-finals of Euro 2016. Hallgrimsson, a part-time dentist, then took outright control of the team and made further history by guiding his country to the World Cup for the first time. But an impressive 1-1 draw with Argentina proved the high point in Russia as subsequent losses to Nigeria and eventual finalists Croatia condemned them to bottom spot in Group D.
"I feel comfortable and grateful for having been part of this strong team spirit that this group has first and foremost maintained," Hallgrimsson said in a statement. "Part of a group that has led the way for future generations and did so many things for the first time in history. It is a privilege to leave the project at a point like today. "The success and performance has created respect for Icelandic football." KSI chairman Gudni Bergsson admitted it was a blow to lose Hallgrimsson. "We had great hopes that Heimir would continue, but the conclusion is that Heimir will leave the team at his own request," Bergsson said. "I would like to thank KSI for the cooperation and wish him all the best in the future. KSI will now take the next step in recruiting a new national coach."